From left, Ford Koles, Executive Director, The Advisory Board Company; Pat Geraghty, CEO of Florida Blue; Will Weatherford, Speaker of Florida House; Don Gaetz, President of Florida Senate; at podium, Rick Mullaney, Director of JU Public Policy Institute. The Affordable Care Act and Medicaid expansion were under the microscope at the recent JU Public Policy Institute Healthcare Policy Conference, a forum that featured industry leaders discussing health care exchanges, spiraling costs, and how to cover 3.8 million uninsured in Florida. JU alumnus Will Weatherford, Republican Speaker of the Florida House, who played a lead role in opposing the ACA’s Medicaid expansion in Florida, repeated media statements about his frustration with lack of coverage for Sunshine State residents and problems with Medicaid. Steven T. Halverson, CEO of The Haskell Co., said health care in the U.S. was a “profoundly broken” system, consuming nearly 18 percent of U.S. GDP, with costs soaring, little accountability for outcomes, over regulated providers, physicians unprotected and no end in sight. However, he said, leaving millions uninsured in Florida, who then use emergency rooms for essentially universal free care, creates a $1,000-per-family “hidden tax” when providers are uncompensated. 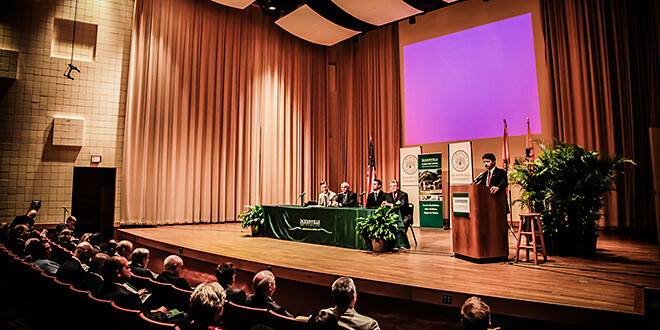 For more about the JU Public Policy Institute overall, visit www.ju.edu/PPI.